Welcome to my blog. I love life, and intend to live a long one! My name is Deb Hubsmith; I was born in 1969 and live in the San Francisco Bay Area and was suddenly stricken/diagnosed with Acute Myeloid Leukemia (AML) on October 17, 2013. Up until that time, I led a full, healthy and active life which I share with my long-time partner and husband Andy Peri. I’ve also worked for nearly 20 years to help build and lead an active transportation movement and I traveled a fair amount for the non-profit organization I founded nearly 10 years ago – Safe Routes to School National Partnership. But the next day I suddenly felt really exhausted, not the normal tired after a big day at a conference, exhausted like I hadn’t been before. But I kept going like always– there was work to do. After I returned home to California on October 4, I continued to feel tired, developed nearly constant nausea and completely lost my appetite. A week later emerged a low grade fever. I thought I had a virus which was going around. I had some bruises on the back of my legs, but I bruise easily and did not think anything of it. What finally got me to the doctor was my menstrual period, which at day four was flowing very heavily, quite unusual for me, and it felt scary. A routine exam showed nothing wrong, but the doctor drew blood and did a Complete Blood Count test, and within a couple of hours called and told me I had to return immediately to the hospital – they needed to do further tests as my blood counts were very “abnormal.” A bone marrow biopsy taken that night confirmed the next day – October 17- that I had acute leukemia. Really? I was the last person that I thought would get cancer. I don’t drink alcohol or smoke cigarettes, I’d had a vegan diet for nearly 20 years, ate organic and non-GMO, minimized the use of cell phones to avoid EMFs, and exercised regularly through walking, bicycling and dancing. Plus, I had felt so good weeks before. How could this be? I was told to pack a bag, as I would be admitted to the hospital and living at Kaiser Permanente during and after chemotherapy – without treatment I would die within a month, maybe a week the doctor said. But with treatment, AML is very curable, she assured me. It turns out, that to be fully cured, I need a bone marrow transplant. As you would imagine, this sudden cancer diagnosis was a complete shock to me, my family, my colleagues and friends. This blog is about healing from AML; it’s also about life, love and the journey we all share. Deb Hubsmith is the founding director of the Safe Routes to School National Partnership which includes more than 600 partner organizations and nearly 30 full time staff. The National Partnership advocates for safe walking and bicycling to and from schools, and in daily life, to improve the health and well-being of America’s children and to foster the creation of livable, sustainable communities. Deb has worked in non-profit management for 20 years, and on Safe Routes to School advocacy, program implementation and legislative development for 15 years. 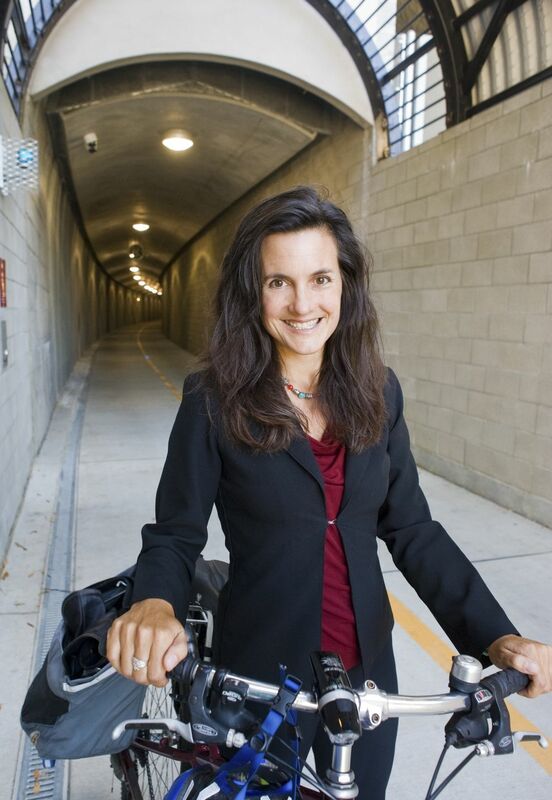 She started as a grassroots advocate and co-led the development of Marin County, California’s award-winning Safe Routes to School pilot program. Deb was the founding executive director of the Marin County Bicycle Coalition in 1998 and then worked as Advocacy Director, building the organization from the ground-up and spearheading big infrastructure projects including bringing $25 million to Marin County for bicycle and pedestrian paths, building the Cal Park Hill Tunnel, and helping to lead the successful campaign to get the SMART train and pathway funded and designed. Deb assisted with the campaign and development of the nation’s first statewide Safe Routes to School program which was created through California legislation in 1999. Deb took the momentum of her local and state successes to the national level where she led a grassroots campaign and worked with Congress to write the legislative language for the national Safe Routes to School program which launched in 2005 as part of the federal transportation bill SAFETEA-LU. More than $1.1 billion has since been allocated to all 50 states and Washington, DC for state programs that are resulting in thousands of miles of bicycle and pedestrian facilities and educational programs that support active transportation for children nationwide. In 2012 and 2013, Deb co-led efforts in California to maintain and increase dedicated funding for active transportation through state legislation which resulted in a new Active Transportation Program providing $130 million/year for projects that support walking and bicycling throughout the state. The Active Transportation Program is now a model for the nation. Deb serves as an energetic spokesperson for active transportation and public health, and has testified before United States Congressional Committees on the ways Safe Routes to School is improving the health of children, communities and the environment nationwide. She has received awards for her work from numerous organizations such as the US Centers for Disease Control and Prevention, the American Lung Association, the Outdoor Industries Women’s Coalition, the California State PTA, the Marin Independent Journal and the Marin Community Foundation. Before her work in active transportation, in the mid 90’s Deb worked to promote ecological sustainability and bioregionalism at Planet Drum Foundation and the Green City Project. She then produced concerts, art shows, poetry readings and dance parties at the San Geronimo Valley Community Center, and co-founded a registered ridesharing program called GO GERONIMO. Deb also taught gymnastics to children for 15 years. Deb got her start in grassroots transportation advocacy in 1996 after a serious car collision; since that time she has used a bicycle, walking, and public transit as her primary means of day-to-day transportation. My career and my passion to create a healthy planet which supports healthy people has been the primary focus of my life for more than 20 years. But I do also have many hobbies and I’m dedicated to my spiritual growth and development. I plan to continue to use dancing, yoga, Reiki and Jin Shin Jyutsu as I heal from my bone marrow transplant, and I’ll be walking and bicycling as much as I can too. Dancing: I love to dance and can’t get enough of it! I even dance when I’m in the hospital when I feel well enough – I’ve been known to do some spins under my IV line! People often ask “what kind of dance?”…to which I say – all kinds! For me, dance is mostly about feeling the music and letting myself drop in to a state where I can move without thinking and let the dance set me free. Dance is a huge form of healing, and is also how I’ve met many of my friends. Some of the places I love to dance include Ecstatic Dance, Sweat Your Prayers and Dance Journey. I like to teach dance too. My partner Andy Peri and I co-founded Contage – the fusion of contact improv and massage, and we’ve been teaching this form at various events since 2008. We plan to be teaching Contage again in 2015 after I’m cured! Yoga: Yoga is the union of the mind, body and spirit and has been a profound practice for me to heal myself, stay strong, and also maintain discipline. I started dabbling in yoga classes in the 90’s but it wasn’t until the winter of 2011 that I truly developed a dedicated yoga practice. I had chronic headaches, and old knee and ankle injuries which plagued me, so at the urging of a friend, I started a home yoga practice for just 20 minutes each morning before I started work. The yoga made me centered, and got me breathing deeply. It transformed my body – relieving me of headaches and bringing alignment to my foundation to further heal my knees and ankles. Inspired by the power of yoga, I enrolled in an Integrative Yoga Therapy teacher training (through Aloha Yoga Shala) in the summer of 2013 at the Kalani retreat center on the Big Island. I loved the training and started teaching yoga to friends when I returned home; then I was diagnosed with cancer. I plan teach more yoga when I am cured, and I have an interest in how gentle yoga could help cancer patients. Reiki: Reiki originated in Japan, and is a hands-on healing technique that brings life force energy to accelerate healing and well-being. When I tore my anterior cruciate ligament (ACL) skiing in 2009, and also damaged the lateral ligament and fractured the tibia, my orthopedic doctor said that I had done so much damage that I would have to wait three months before he would do surgery. While I was skeptical at first, as I waited for the surgery date, my friend Samantha Russell Raven started giving me Reiki sessions. And at the urging of several healers, I started doing self-healing meditations to bring light energy into my body and to visualize my knee fully healed. When Samantha gave me the Reiki, I noticed that heat would generate in my knee, and sometimes I would have twitches of energy releases – something was happening! I was asked to speak in Washington DC during the time of my surgery, so I canceled my surgery appointment and continued with the Reiki and meditation practices. My knee felt strong, so I had my doctor do a second MRI six months after my injury and he was amazed that I actually grew back my ACL – something that medical literature said was impossible. Encouraged by these results and curious about what else was possible, I began studying Reiki in January 2010 with Christopher Campbell, founder of the Awakening Heart School. After intense study and practice, I was certified three years later as a Reiki Master Practitioner. I use Reiki now to help myself and others to foster physical and emotional health. Jin Shin Jyutsu: I had my first Jin Shin Jyutsu healing session with Lonner Holden (415-474-4108) in the hospital during January 2014 while recovering from a consolidation chemotherapy treatment. The next day, I saw a big jump in my white blood cells! Like Reiki, Jini Shin Jyutsu also originated in Japan. It is an ancient art that brings the body’s energies into alignment by releasing tensions, and integrating mind, body and spirit. The practitioner gently touches key points on the body while the receiver simply relaxes. Acupressure grew out of the ancient Jin Shin Jyutsu practice. My Mom and my partner Andy are receiving some training in Jin Shin Jyutsu so that they can use this healing technique with me as I recover from the bone marrow transplant. Walking and Bicycling: I can’t say enough good things about walking and bicycling, but I’ll mention a few! These methods of transportation are also fabulous forms of recreation and provide a wonderful opportunity to re-connect with the surrounding community. With the need to reduce greenhouse gas emissions and curb climate change – human powered transportation provides a way for everyone — from kids to seniors — to be part of the solution and become role models for creating a healthy planet. Walking and bicycling are also great ways to get exercise (adults need 30 minutes/day and kids need 60 minutes/day). Plus, studies show that people who walk while they are at the hospital get out sooner. I plan to be walking every day that I possibly can at Stanford, and during my recovery. You are wonderful and inspirational person. My prayers and best wishes for you golden child. Aloha Deb! You are one heck of a powerhouse, and I’m so glad to hear you are getting great treatment. My thoughts are with you.